For some reason, up until fairly recently I didn’t do many dedicated coffee reviews, aside from the short-form Espresso Quest and the even shorter form Coffee 100 list. 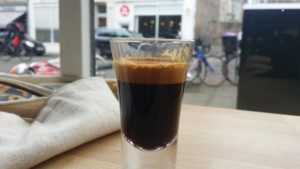 With the opening of a rash of West End places showcasing excellent coffee, including Brew Lab West End and Strumpets, I’ve found myself doing more and more of them, though. This meant that the fact I hadn’t reviewed Gamma Transport Division before now seemed rather silly. 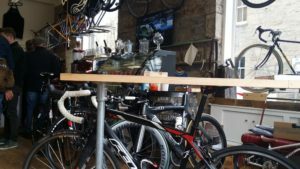 Part bike store, part coffee shop, I’ve been visiting on a regular basis since it opened. It’s just across the road from Mr Eion’s roastery and retail shop, with Gamma having been the first stockists of Eion’s wares. I ordered espresso and took a seat at one of their window shelf seats. The shop was a busy hive of cycle repair activity. The coffee was excellent as it invariably has been on my visits. This was the grey squirrel blend I was sampling, today. I liked it a lot. So overall, I’m glad to finally write some words about Gamma as it’s a real favourite coffee stop-off point for me. I look forward to many future stops and would heartily recommend it to you.